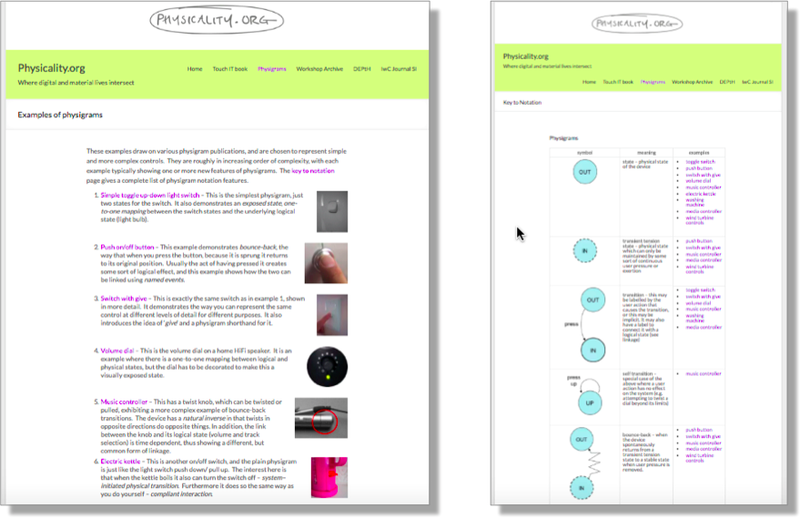 Physigrams get their own micro-site! Appropriate physical design can make the difference between an intuitively obvious device and one that is inscrutable. Physigrams are a way of modelling and analysing the interactive physical characteristics of devices from TV remotes to electric kettles, filling the gap between foam prototypes and code. Sketches or CAD allow you to model the static physical form of the device, and this can be realised in moulded blue foam, 3D printing or cardboard mock-ups. Prototypes of the internal digital behaviour can be produced using tools such as Adobe Animate, proto.io or atomic or as hand-coded using standard web-design tools. 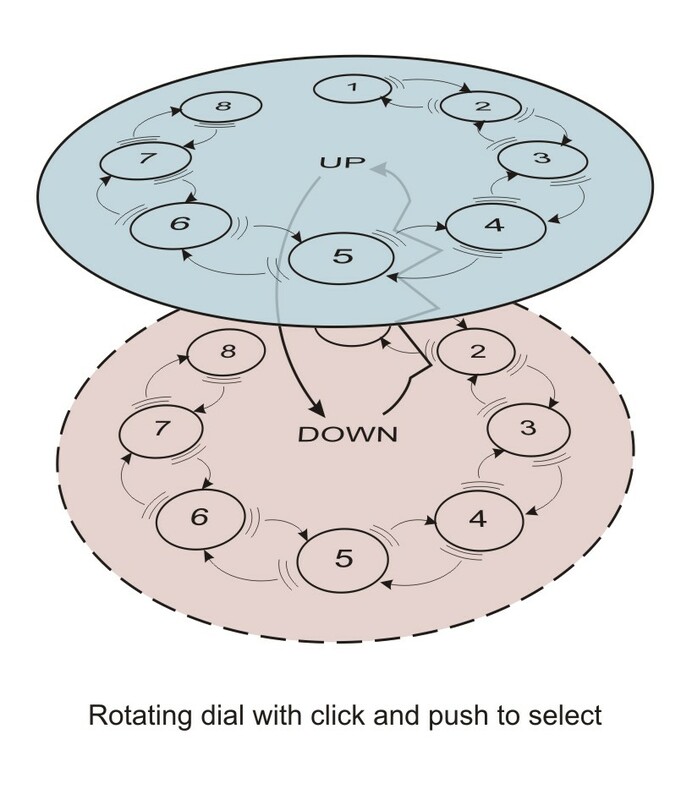 The digital behaviour can also be modelled using industry standard techniques such as UML. 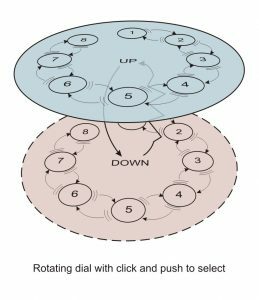 Physigrams allow you to model the ‘device unplugged’ – the pure physical interaction potential of the device: the ways you can interact with buttons, dials and knobs, how you can open, slide or twist movable elements. These physigrams can be attached to models of the digital behaviour to understand how well the physical and digital design compliment one another. Physigrams were developed some years ago as part of the DEPtH project., a collaboration between product designers at Cardiff School of Art and Design and computer scientists at Lancaster University. Physigrams have been described in various papers over the years. However, with TouchIT ,our book on physicality and design (eventually!) reaching completion and due out next year, it felt that physigrams deserved a home of their own on the web. 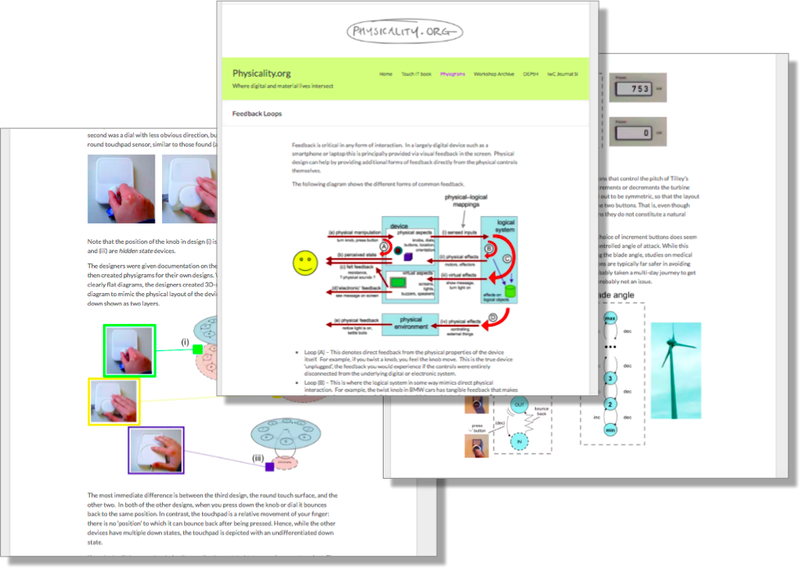 The physigram micro-site, part of physicality.org includes descriptions of physical interaction properties, a complete key to the physigram notation, and many examples of physigrams in action from light switches, to complete control panels and novel devices. I’ve been (belatedly) reading Adam Greenfield‘s Everyware: The Dawning Age of Ubiquitous Computing. By ‘everywhere’ he means the pervasive insinuation of inter-connected computation into all aspects of our lives — ubiquitous/pervasive computing but seen in terms of lives not artefacts. Published in 2006, and so I guess written in 2004 or 2005, Adam confidently predicts that everywhere technology will have “significant and meaningful impact on the way you live your life and will do so before the first decade of the twenty-first century is out“, but one month into 2010 and I’ve not really noticed yet. I am not one of those people who fill their house with gadgets, so I guess unlikely to be an early adopter of ‘everywhere’, but even in the most techno-loving house at best I’ve seen the HiFi controlled through an iPhone. Devices are clearly everywhere, but the connections between them seem infrequent and poor. Why is ubiquitous technology still so … well un-ubiquitous? Steve Gill is visiting so that we can work together on a new book on physicality. Last night, over dinner, Steve was telling us about a litter-bin lock that he once designed. The full story linked creative design, the structural qualities of materials, and the social setting in which it was placed … a story well worth hearing, but I’ll leave that to Steve. One of the critical things about the design was that while earlier designs used steel, his design needed to be made out of plastic. Steel is an obvious material for a lock: strong unyielding; however the plastic lock worked because the lock and the bin around it were designed to yield, to give a little, and is so doing to absorb the shock if kicked by a drunken passer-by. This is a sort of Judo principle of design: rather than trying to be the strongest or toughest, instead by yielding in the right way using the strength of your opponent. This reminded me of trees that bend in the wind and stand the toughest storms (the wind howling down the chimney maybe helps the image), whereas those that are stiffer may break. Also old wooden pit-props that would moan and screech when they grew weak and gave slightly under the strain of rock; whereas the stronger steel replacements would stand firm and unbending until the day they catastrophically broke. Years ago I also read about a programme to strengthen bridges as lorries got heavier. The old arch bridges had an infill of loose rubble, so the engineers simply replaced this with concrete. In a short time the bridges began to fall down. When analysed more deeply the reason become clear. When an area of the loose infill looses strength, it gives a little, so the strain on it is relieved and the areas around take the strain instead. However, the concrete is unyielding and instead the weakest point takes more and more strain until eventually cracks form and the bridge collapses. Twisted ropes work on the same principle. Although now an old book, “The New Science of Strong Materials” opened my eyes to the wonderful way many natural materials, such as bone, make use of the relative strengths, and weaknesses, of their constituents, and how this is emulated in many composite materials such as glass fibre or carbon fibre. In contrast both software and bureaucratic procedures are more like chains – if any link breaks the whole thing fails. Steve’s lock design shows that it is possible to use the principle of strength in weakness when using modern materials, not only in organic elements like wood, or traditional bridge design. For software also, one of the things I often try to teach is to design for failure – to make sure things work when they go wrong. 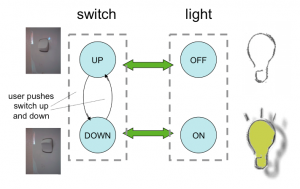 In particular, for intelligent user interfaces the idea of appropriate intelligence – making sure that when intelligent algorithms get things wrong, the user experience does not suffer. It is easy to want to design the cleverest algotithms, the most complex systems – to design for everything, to make it all perfect. While it is of course right to seek the best, often it is the knowledge that what we produce will not be ‘perfect’ that in fact enables us to make it better. Just a week to go for deadline for this workshop on the Designing for Reflection on Experience that Corina and I are organising at CHI. Much of the time discussions of user experience are focused on trivia and even social networking often appears to stop at superficial levels. While throwing a virtual banana at a friend may serve to maintain relationships and is perhaps less trivial than it at first appears; still there is little support for deeper reflection on life, with the possible exception of the many topic-focused chat groups. However, in researching social networks we have found, amongst the flotsam, clear moments of poinency and conflict, traces of major life events … even divorce by Facebook. Too much navel gazing would not be a good thing, but some attention to expressing deeper issues to others and to ourselves seems overdue.